With about 500 days left, this looks like a good time to quickly describe the plans of some notable participating teams. In some cases, information is not available, or not complete enough to warrant much discussion. But let's start with an updated list of teams. This list is probably incomplete, but represents the majority of the active teams including some that one should consider at the head of the class, Team Prometheus for example. If your team is missing from this list, and has a web page, please comment to this post or email me (link at the upper right of the page) so that this list can be updated. Neblua Aerospace has a very nice web page, with some images showing test equipment. While quickly browsing, I was unable to find any detailed images or plans for the rocket, however. The Cerberus rocket is planned to fly with an 8 component aerospike engine. Epsilon Vee has planned to build a rocket called CESTUS 1, or Common Expendable Space Transportation for Ultra-small Satellites. This very small rocket is only "8 inches in diameter, roughly 12 feet long, weighing in a some 180 lbs (82 kgs). Primarily 6061 aluminum, lox / propane propellants and ablative engines. 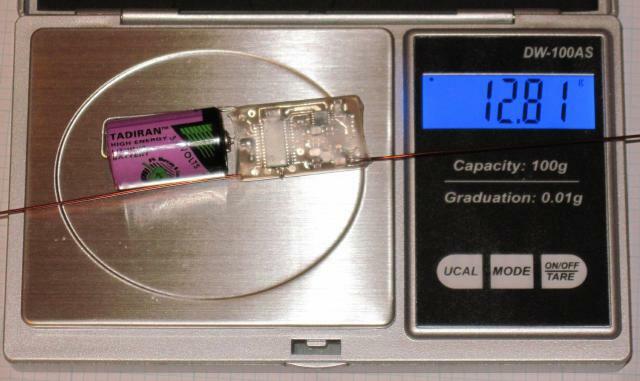 It has a payload of a whopping 1 lb (455 g)!" 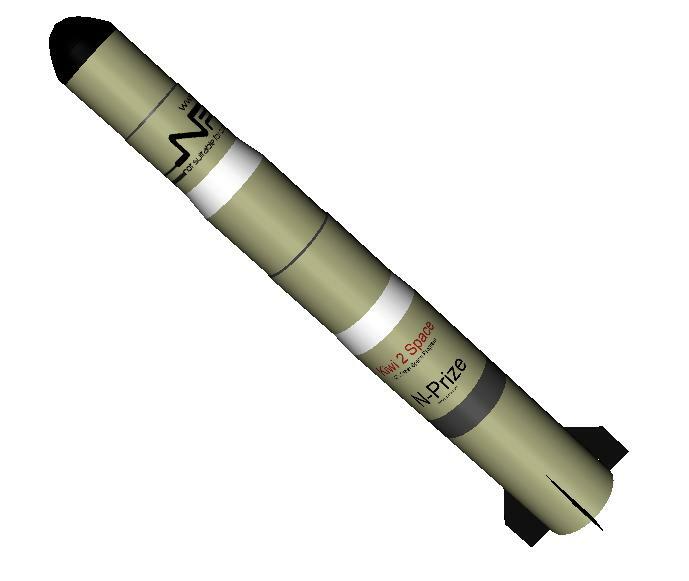 It is unclear if a rocket like this could ever launch payload to orbit, largely because small rockets suffer from severe low atmosphere drag and mass fraction ratios. It should be noted that this rocket has not been built yet, and the latest update here was from 2008. To promote experimental research rocketry in the South Africa. To promote mathematics and science through rocketry in education. To reach the altitude of 100km, a first for a private institution in SA. 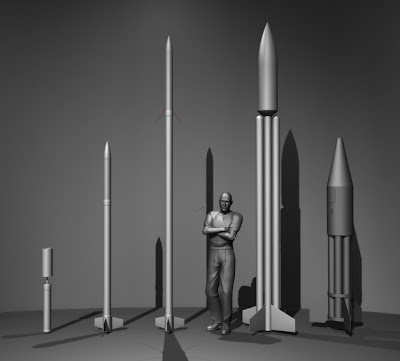 The rocket on the right, which looks a bit like the NOTS-EV-1 Pilot (NOTSNIK) rocket, appears to be the N prize rocket - perhaps combined with the taller rocket next to it. Details are limited on this, and like on most pages, updates are mostly from 2008. 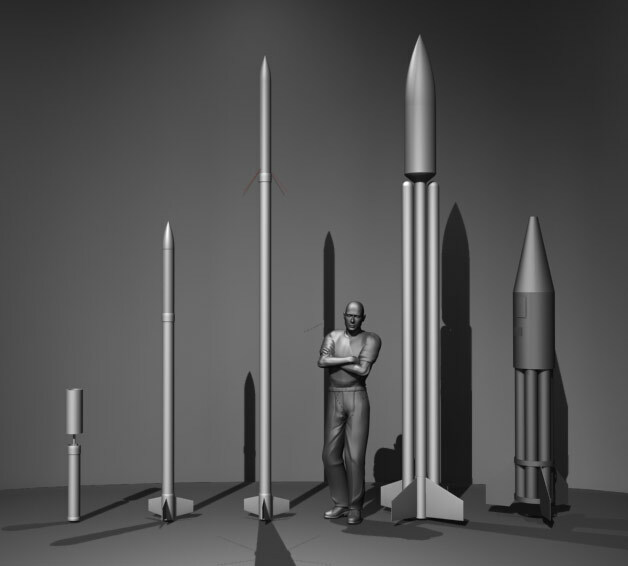 Micro Launchers has some solid information on their rocket plans. There is a short presentation available on very small rockets. 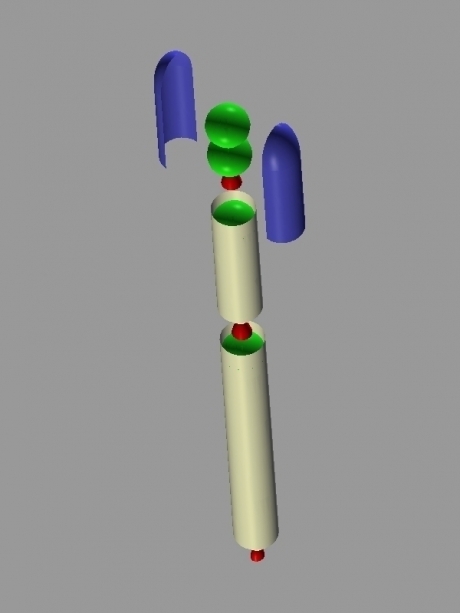 This first rocket is called a cansat launcher, made to launch nano or pico-satellites. This rocket would certainly be the smallest satellite launcher ever used, particularly if it is launched from the ground. The high mass-fraction, high ISP bipropellant stages are a great idea. But, as usual, rockets this small suffer severe drag losses at low altitude. Most updates are several years old. Potent Voyager has not updated their web page or posted any plans that I have found, since announcing their entry into the n prize competition on 8/8/2008. This seems to be, sadly, a common trend among these teams. What happened in 2009 that made them stop? We plan on using a 3 stage liquid fuelled rocket to reach low earth orbit, consisting of a pump fed booster (money and time permitting or else we will resort to a pressure fed booster) and liquid fueled upper stages, from which the propellant choice is still yet to be confirmed. The rocket will be ground launched from a mobile launch platform. The 19.99g satellite will be placed in a 200km high circular orbit with an inclination of 34deg. The size of the rocket will enable us to launch multiple satellites giving us more chance of winning the prize if one is to fail. This added redundancy has been incorporated into the design so the rocket still achieves the required Delta V for orbit. For a 200km circular orbit the satellite needs a Delta V of 7786m/s to stop it dropping out of orbit, so the total rocket Delta V will be in the realms of 9300m/s." Yit Space This web page is no longer active, it has been parked. Aerosplice has some interesting work that revolves around a strategy of using air breathing or air augmented booster stages (pulse jet, ramjet) that do most of the heavy lifting. "Why is the Aerosplice approach better? Every second that a conventional rocket burns fuel, it plows through economic resources, and leaves a wake of a destroyed budget behind. Why begin acceleration as a rocket? There are so many options now to reach reasonable speeds at a cost of a thousand times less than that of conventional rockets. To go from stationary (at rest on the launch pad) to orbital velocity (Mach 25) or even escape velocity (Mach 35) a vehicle must accelerate. 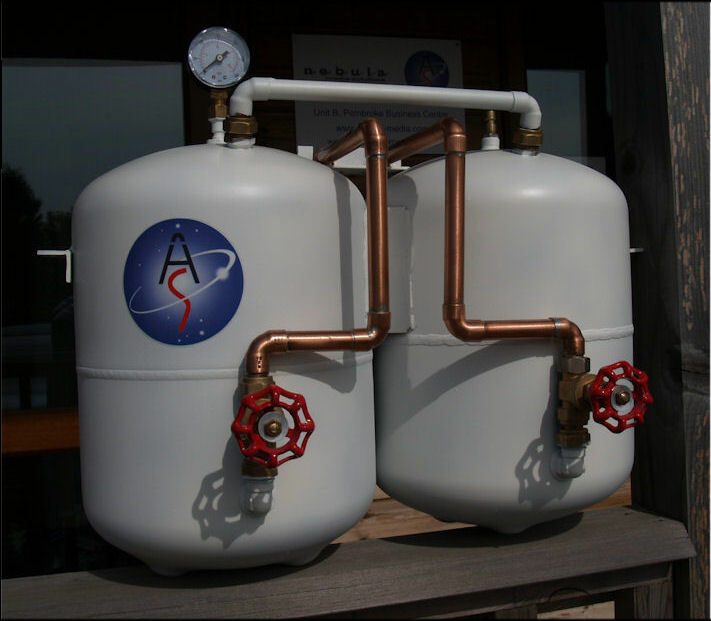 Acceleration requires that you continuously burn more fuel or decrease the mass of the rocket continuously. So shouldn't that burnt fuel be as inexpensive as possible to achieve the maximum acceleration and altitude (potential energy)? Of course! Especially if that fuel is as cheap as Kerosene or nearly free in the case of hydrogen produced from sunlight and water. 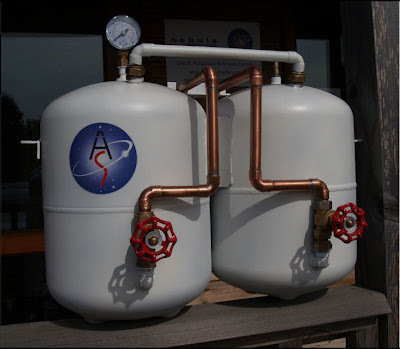 Currently the conventional rocket fuels of choice are extremely expensive such as liquid Hydrogen/ Liquid Oxygen, Liquid Oxygen/ Kerosene, or Nitrogentetroxide/ Hydrazine. When using conventional rockets most of the vehicle's weight is fuel! 90%! and only a tiny percent is payload, usually between 2% and 5% . That has to Change. What Aerosplice provides is alternative technologies to the expensive conventional routes to space. Technologies like valveless pulse jets to get the rockets off the launch pads and get them up to speeds between Mach 0.5 and Mach 0.9. Then Ramjets to get the Rockets to speeds greater than Mach 10. Then finally Hydrogen Peroxide based rocket engines to get vehicles into space and beyond. We also do extensive research into Ion, Plasma and Hydrogen Fusion systems for travel between planets and for satellite re-orientation." Daedalus Aerospace has a Google groups page with some fairly recent updates. Balloon work is one highlight of their "recent" progress. Team 9.99 has a great looking web page. Sadly, they do not have any further information on this web page! Valkyrie has some information about their plans, and updates on some very different topics, but little in the way of specific information. Thomas Space Corp has a cool picture, but no real web page. has a simple web page with a statement of intent. They are a rather late entry into the N prize, so perhaps it is somewhat more reasonable that they do not have much information yet. It appears, in all honesty, that these N prize teams are for the most part stagnating or falling behind. There is nothing shocking or shameful in this; rocketry is hard, expensive, and for almost everyone, just a hobby. 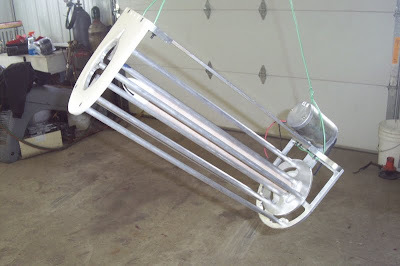 Large projects seldom wind up flying, even projects that are designed to fly a simple hobby rocket to 100,000 feet. Orbit is much harder, and the N prize is very constraining. There is little chance that any team will even attempt a credible N prize launch. Having said that, great benefits can be gained from such a competition even if it is essentially impossible. If Team Prometheus is able to do a few rockoon launches, perhaps culminating in an N-10,000 rockoon flight to space with a camera, that would have made the whole competition worthy of our time and attention.